I had always thought that all early photography was Daguerreotype; those pictures of frock coated men and crinoline women staring fixedly at the camera for the lengthy exposure. The wonderful exhibition at the Tate Britain, Salt and Silver, educated me and also moved me in the beauty of some of the images and the sense of looking back in time to a very different world of nearly two hundred years ago. Daguerreotype was a technique invented by Louis Daguerre in 1839 and involved a highly polished silver-coated copper plate that was treated with fumes to make it light sensitive. It was then exposed in a camera, treated with mercury fumes and had its light sensitivity removed by liquid chemical treatment. The plate was then put behind glass to protect it. 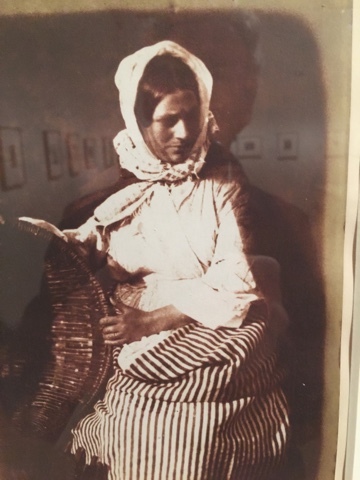 At the same time in England, William Henry Fox Talbot was working on a different technique that involved using a camera obscura to direct an image onto paper coated with silver salts. When he shone sunlight through the resulting negative image, a positive image appeared. These were the first photographic prints. These prints have a softer interplay between light and shade than the Daguerreotype – and could also be reproduced. The images in the exhibition demonstrate well the added beauty of the Salt and Silver method. 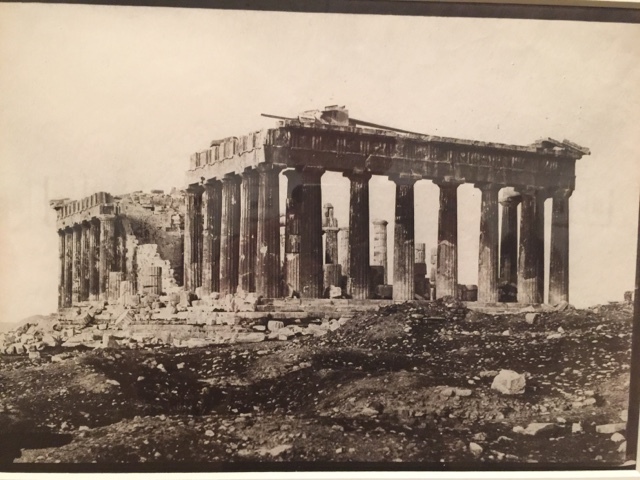 There are landscapes and images of some of the ancient sites of Europe and the Middle East – including one here of the Parthenon not long after its partial destruction during the Greek war of independence. To my mind, more interesting and moving are the portraits, particularly of fisherman and their families on the Edinburgh coast. The working hands of the woman below are something that paint portraiture never gets. One portrait of an officer of the British army in the Crimea shows the devastating effects of shell shock – for the first time surely? This is the moment when history ‘comes alive’, when for the first time what people really looked like, or how towns and fishing villages actually appeared can be appreciated. It is faintly unsettling as you are more used to seeing that world through the prism of an artist’s eye and brush with all the artificiality of composition and paint. The mezzotint hues are of the time – but this is recognizably the modern world.